Of all the people to start us off, we get famed historian Doris Kearns Goodwin (!) to give us the history of the construction of the house. First off, as a history teacher, huge geek out moment for DKG! Edward Phillipe Mott (Evan Peters… finally), a reclusive socially anxious wealthy art collector, bought the land and ordered construction of the estate. He lived alone with only his art and lover and service staff. When one night his entire treasured collection is vandalized, he locks his entire staff in the same dug out cellar where the Millers found Dr. Cunningham’s videotape. Soon after, Edward is left alone and the Roanoke ghosts come for him, impaling him in gruesome fashion. Fast forward to the Millers facing the wrath of the Butcher and her clan, and who should help them escape the house, but the ghost of Edward Mott himself. He built underground tunnels that lead to the woods. The camera work as the pale ghost talks to them is just fantastic and scary. One horror ended, another begins. The are immediately kidnapped by the Polk family and their matriarch (Frances Conroy). The find Cunningham (Denis O’hare) alive, but in pieces wishing for death. The Polk family struck a deal with The Butcher to keep fresh sacrifices around each year, in exchange they can stay on their land and be left in peace. Soon, Cunningham is dead and The Millers appear to be the next sacrifices. An escape attempt backfires and Mama Polk honors fellow cast member Kathy Bates by pulling an Annie Wilkes and crushing Shelby’s ankle with a sledgehammer. Shelby uses the word “miracle” to describe how they managed to live through this. 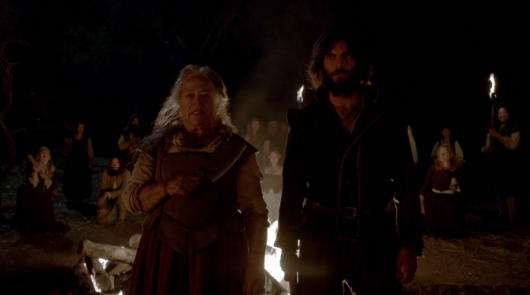 After the Mama Polk offers the Millers to Thomasin, it’s Thomasin’s own son Ambrose (Wes Bentley) who attacks his mother, dragging her into the fire. To be fair, she did murder him and the whole clan with a Jonestown-style cocktail, so maybe he was finally getting revenge. Lee (Angela Bassett/Adina Porter) is freed from jail and shows up at the farm just in time to run over Pigman, help everyone into the car and away they go to a cheap hotel in a very Poltergeist ending. The question is: where do they go from here? The Millers make it abundantly clear the are never going back to that house. We see in previews for next week, that the production team conducting all the interviews is going to feature prominently, probably going to check out whether the stories are for real. That would be very interesting in terms of total plot rearrangement. AHS has been known to switch horses mid-stream, sometimes for the better and sometimes for the worse. Last season the story went from Countess heavy to serial killer heavy. But a season earlier they jumped the shark and killed Twisty the Clown in episode 4 of the season, rendering the rest of Freakshow momentum-less. I am along for the ride either way as this was yet another crazy, violent, and disgustingly great episode and my intrigue level is way up to see the new direction next week. American Horror Story: My Roanoke Nightmare returns next Wednesday night at 10:00 only on FX.